Varel Morvayn is a Dunmer smith and merchant who owns Morvayn's Peacemakers in Anvil. In the shop, which doubles as his house (he lives upstairs), he sells weapons and armor and offers repair services every day between 8am and 8pm. Among his wares is the unique weapon Truncheon of Submission. With over three decades of experience, Varel has built up a good reputation in town and keeps his shop open for twelve hours every day. After closing up at 8pm, Varel takes an evening walk in the western area of Anvil, talking to the other townsfolk, before returning home at 11pm. After wandering around there for an hour, he heads upstairs and goes to sleep next to his apprentice Enilroth for six hours. In the morning, he will walk restlessly around his shop for two hours, preparing himself for yet another day of hard work. His attire is typical for a man in his business: a blacksmith's apron and pants, as well as a pair of rough leather shoes. He carries his key and a small amount of gold. When approached, he will give you some background information about his shop: "Varel Morvayn. Been making weapons and arms here in Anvil for 30 years. People say I do good work, and I don't aim to argue with them." When asked about the city of Anvil, he will reflect on the future for his shop: "Been here thirty years, and I expect I'll last another ten or so. When I'm gone, gods willing, my apprentice, Enilroth, will tend the smithy." When asked about Anvil, Enilroth will say: "Varel Morvay's [sic] been a good master. I like the town and the people. No reason why I wouldn't want to be here for many years... just like the master." 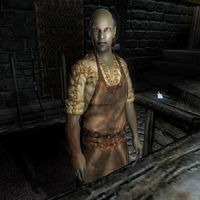 Down at The Flowing Bowl, Caenlorn will recommend Varel's shop: "Best shops in Anvil? Norbert Lelles handles rare books, exotic ingredients, and gems, and they have fine weapons at Morvayn's Peacemakers." This page was last modified on 7 September 2018, at 19:16.